Want the most effective solution for cooling your laptop? By including grooved channels that are built to enhance airflow, the ThermaPak 17" HeatShift Laptop Cooling Pad has been proven to lower laptop temperature by 10 degrees more than your average USB cooling fans. This advanced self-cooling HeatShift Pad is built to deliver a fast, effective cooling method, and uses no wires, no refrigeration, and no power (which will significantly extend your battery life). 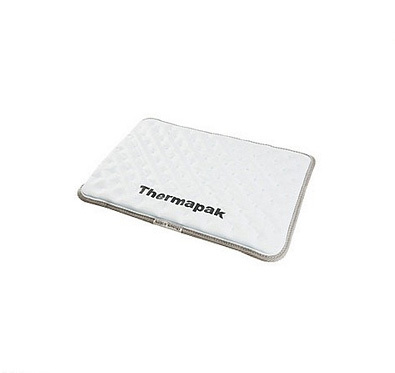 Incredibly eco-friendly, this white ThermaPak 17" HeatShift Laptop Cooling Pad will uniformly cool your portable PC by using organic cooling crystals that dissipate heat away from your laptop, all while allowing it to perform at a safe temperature. If you're looking for simplicity and effectiveness in your notebook cooling, a ThermaPak Cooling Pad is sure to be the best method.